Hello everyone! Today I’ve got swatches of Fair Maiden Polish’s Pack Your Bags: A Travel Adventure collection 🙂 This collection consists of 16 polishes (8 creme and effect duos) inspired by various travel locations from all over the world. This is their spring collection so it launched a while ago but lucky for you, it’s still available! My plan was to get swatches up much earlier but my recent move to the east coast put a damper on that so I apologize in advance for the various nail shape/length of my swatch photos. Sakura Blossom (C) is a creamy, soft pale pink creme. Shown here is three coats plus top coat. There was some patchiness at the base of my nail after the second coat but adding the third coat covered it all up. The formula is quite nice – easy to apply and evens fairly well. Sakura Blossom (E) is a soft pale pink creme with rose pearl sparkle and color shifting chameleon flakes. Shown here is three coats plus top coat. Each coat builds well and is very easy to control. Bisous (C) is a creamy pistachio green creme. Shown here is three coats plus top coat. Slight patches at the base of the nail after the second coat so that’s why I added a third. Other than that, formula is great and I LOVE the pistachio green shade! Bisous (E) is a pistachio green crelly packed with various colored glitters in different shapes and sizes. Shown here is three coats plus top coat. Thin coats are recommended on FM’s site and I second that. I do wish there was more glitter but it’s not a deal breaker. Fiesta…Siesta (C) is a muted yellow creme. Shown here is three coats plus top coat. This polish dries very fast so you’ll want to work quickly with minimal brush strokes to get the best coats. I found that this polish leveled best with thin coats. Fiesta…Siesta (E) is a golden yellow linear holo packed with bright lemon shimmer. Shown here is two coats plus top coat. One word: Fantastic! Pearl of Siberia (C) is a taupe hued gray creme. Shown here is two coats plus top coat. The formula is amazing and is practically opaque in one coat! Pearl of Siberia (E) is a gorgeous taupe hued gray linear holo with iridescent hex glitters and a purple-silver shimmer. Shown here is two coats plus top coat. Moon Over Morocco (E) is a medium orchid purple linear holo with added holo micro glitter. Shown here is two coats NO top coat. Good Eye Might (E) is a medium turquoise scattered holo with sea-green shimmer and color shifting flakes. Shown here is two coats plus top coat. The formula is a little thick but is easy to control. It has amazing coverage and I love the added flakes! Santorini Bikini (C) is a rich and deep azure blue creme. Shown here is ONE coat plus top coat. All I have to say is WOOOWWW! This is one polish that you definitely must pick up from this collection! Santorini Bikini (E) is a rich and deep azure blue linear holo with color shifting blue-orange shimmer throughout. Shown here is two coats plus top coat. This polish was opaque in one super smooth and easy coat but I added a second to deepen the azure color. Rio Carnival (C) is a must have dusty coral creme. Shown here is two perfect coats plus top coat. This is Fair Maiden Polish’s largest collection to date and it can seem a bit overwhelming at first but to me, it all makes sense! I love how this collection is broken down into 8 duo sets – each creme and effect duo work perfectly together! There is literally something for everyone – from colors to finishes there’s bound to be one you can’t live without. Besides slight patchiness with some of the cremes and needing thin coats for others, I had no major issues with any polishes in this collection. 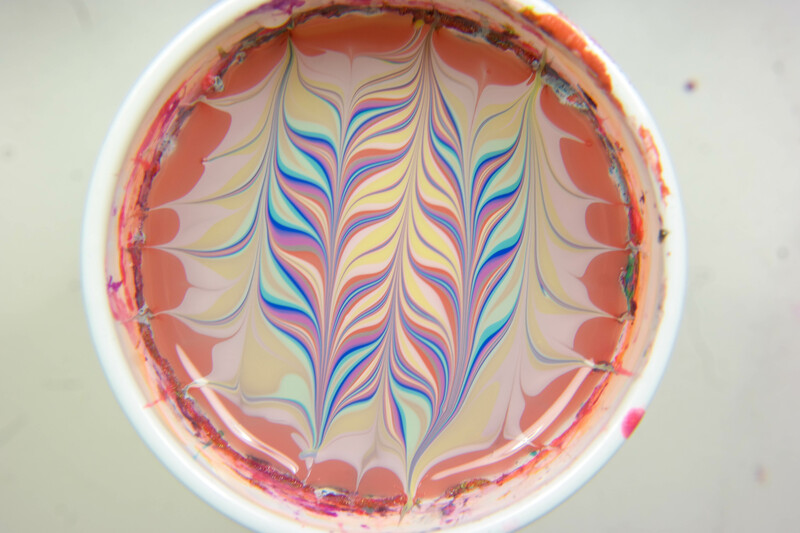 I want to mention that the cremes watermarble fantastically – check out the pics below! Now comes the hard part, picking favorites! Since this is a duo collection, I think it makes sense for me to pick my favorite duo sets – Rio Carnival, Santorini Bikini, and Good Eye Might! As I stated in the beginning, this collection is currently available now and can be purchased here. Each polish in this collection is available in full (15 mL) and mini (7.5 mL) size. All cremes are priced at $8.50 for full and $4.50 for mini. All effects are priced at $10 for full and $6 for mini with the exception of Sakura Blosson (E) – $9.50 for full and Bisous (E) – $8.50 for full. For more information on this collection and their most recent Feline Catty collection, check out Fair Maiden Polish on Facebook and Instagram! Your swatches always make me want EVERY one! Great job swatching this super large collection!